I bought this pretty tote bag but it didn't have any pockets. I hate to dig around my bag for my stuff. I started searching around the internet for a tote organizer because I remember seeing some such thing quite some time ago. I found this design and it was simple enough to sew. The size of the pockets are sized according to the item that goes into each of them. This is how it looks like with my things in the pockets. 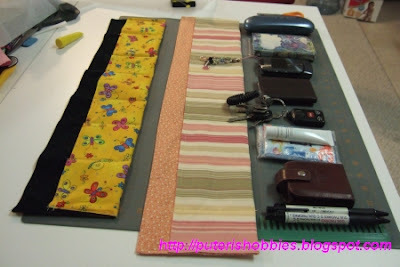 Maybe next time I'll use a heavier interfacing so the organizer will be stiffer and can stand more upright. Spread the organizer along the sides of the tote bag and the empty space in the middle is where my wallet, cough drops, camera, and dental floss go. 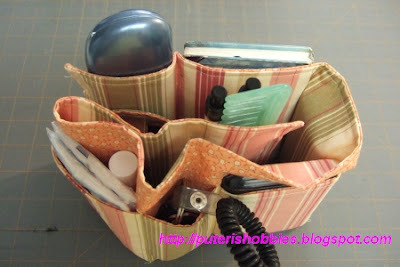 :-) Thanks to the designer of this tote organizer, whoever she is, for coming up with something so practical! Next time, when I need to change to another tote/purse, I only need to remove the organizer and a few miscellaneous stuff. 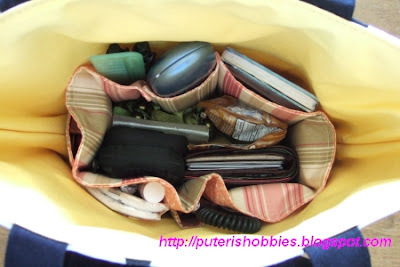 Amat manah tote organizer tu, very practical! 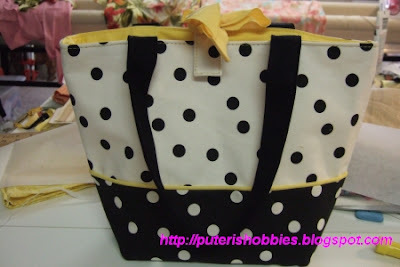 Aku ka give away some of my totes to friends, and I will include the tote organizer with the tote. Ehh, belajar lah bejait! I am enjoying my break from beading!